Note: full memory usage only is possible at 4.0MB board! Minimig is developed by Dennis van Weeren, freely available unter the GNU public license V3 and can be ported, altered or expanded as long as the sources will be published as well. 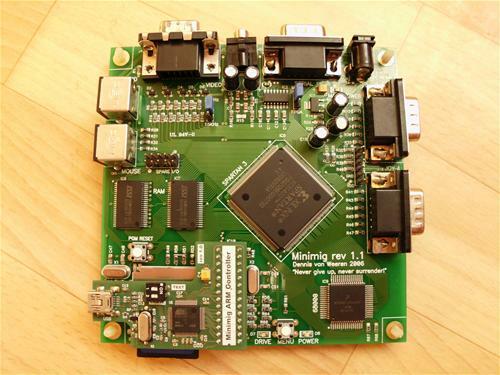 The whole system grow in time and may also break several limits (such as the 2.0MB Chipmem limit of real Amiga chipsets). Minimig in general is the Verilog FPGA source code with the C sources for PIC or ARM controler. For each different board an individual FPGA core must be synthesized to make use of it. The OSD act as preferences or "GUI" to setup the system for any kind of requirement via keyboard or joystick. Some software need special memory, CPU speed, Kickstart or Floppy drive settings to work properly. 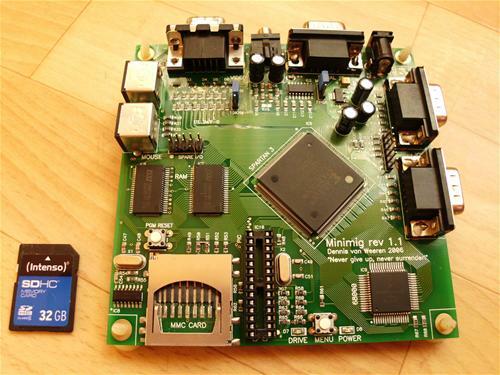 Memory and Kickstart settings require an Amiga-reset to get active. Chipset and CPU frequence selection take affect directly on the fly, same as the additional Video filter and Scanline simulation. Video is 12Bit analog RGB (max. 4096 colors) and provide original 15KHz PAL/NTSC or 31KHz double-scan (not flicker-fixed) VGA 50/60Hz output, selectable via a jumper on the Minimig board. 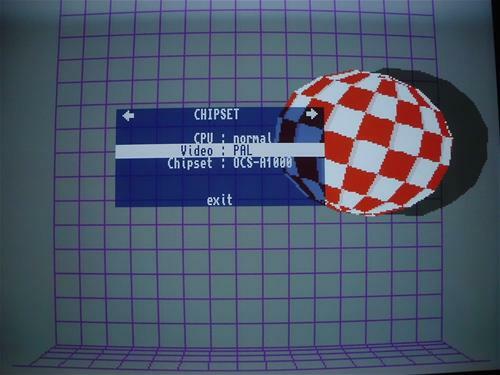 Vision is native/smooth as any real Amiga model. There is no frame skip as known from software emulation. PIC/ARM is a permanent programed micro controller (MCU) and need to be flashed with a compiled firmware file. 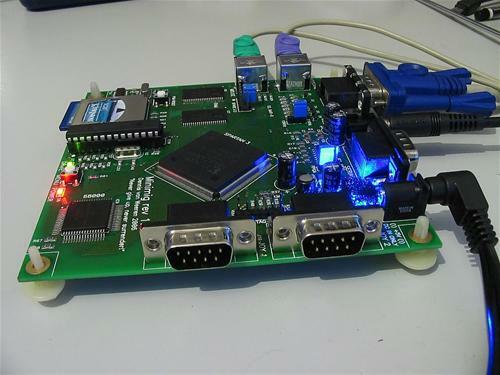 FPGA always is empty without power and will be programed via MCU at bootup. 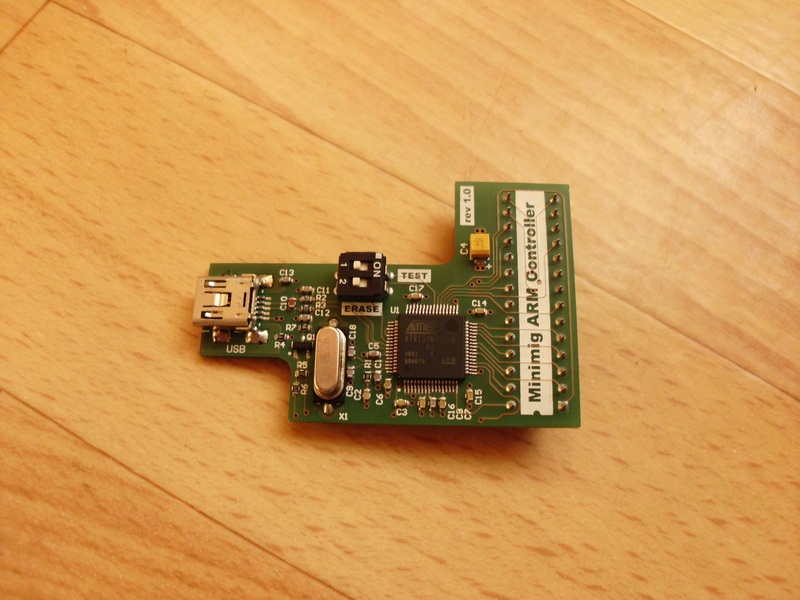 The FPGA core file has to be named "Minimig1.bin" at sd-card root. 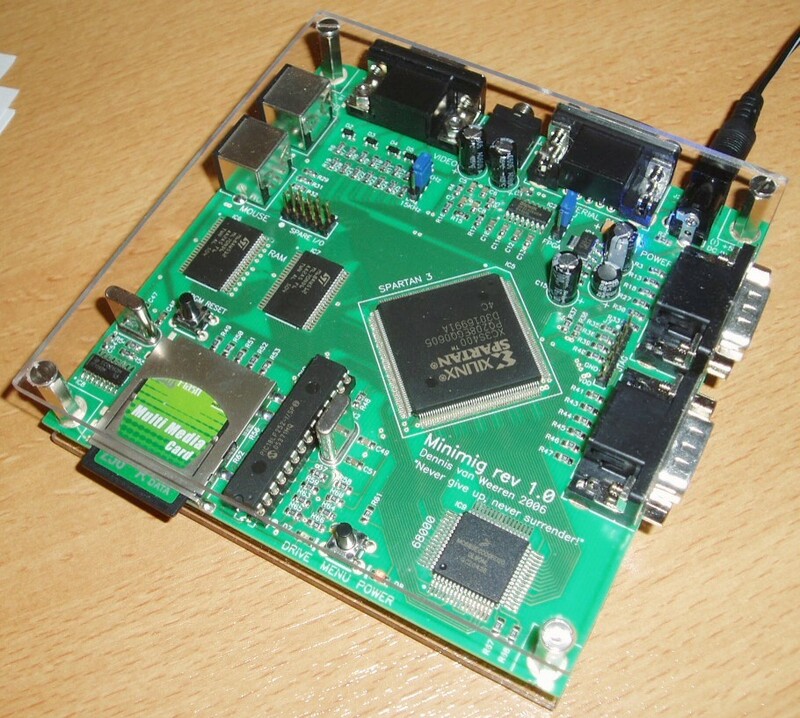 FastSPI mod, bridge between R50 & R51: speed-up sd-card data transfer a lot if its set active in ARM firmware via OSD. Without the modification the FastSPI mode MUST NOT be active! It will lead to data damage! Audio mod, remove R15: will 100% separate both Amiga audio channel like in any real Amiga model. With R15 in place the left and right channels are slightly mixed together. Most likely done to get a more smooth stereo output, but it also makes sound output a bit lower.